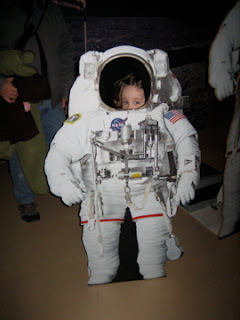 At the recent "Return to the Moon" night at NASA Ames, Elise had an opportunity to pretend to be an astronaut. It's safe to say that she did not get to indulge in brownies and coffee like I did when I was a kid living on the moon. Luckily for Elise, technology is always improving and there's the possibility (slim, but still there) that she could one day tell her kids about her cool moon house. To me, this thing looks a little like one of those bouncy house things that people rent for kids' parties, only without the annoying Disney characters plastered all over the outside. We're going to have some fun making up stories about this one!